Banffshire & Buchan Coast MSP Stewart Stevenson is highlighting the importance of Ask Your Pharmacist Week, which takes place from 5th – 12th November. “I applaud and support this significant initiative and the theme of engaging men who should be encouraged to take a more active interest in their medicines. “It has to be noted that community pharmacists are uniquely accessible healthcare professionals that offer real value and should never be underestimated by customers and patients. “We must remember that in some pharmacies – health checks are offered and these should be utilised as in some cases this cuts out the need for patients to visit their local GP. Two Scottish projects have made it through to the shortlist of CCS projects which will now be considered for financial support. The UK Government today announced that carbon capture projects in Peterhead and Grangemouth had both made it onto a four project shortlist that will be considered for financial support in the New Year. It was also announced that Peterhead would be considered a reserve project when applying for European funding through the NER300 scheme, while the Sound of Islay Tidal project has been put forward as a full candidate project for NER300 funding. “It is positive news that Peterhead is one of two Scottish projects to make it onto the final shortlist for funding for carbon capture. “I firmly believe that Peterhead has an extremely strong case to make and I would certainly hope that the UK Government will fully recognise that when it makes its decisions in the New Year. “Westminster has a sorry track record when it comes to supporting innovative carbon capture projects in the past, with jobs and investment allowed to slip away before at Peterhead and Longannet. “The fact that Scottish projects make up half the shortlist for CCS funding clearly reflects the fact that Scotland has the biggest CO2 storage capacity in Europe. On Thursday (25 October) during a voting session at the European Parliament’s plenary session in Strasbourg, a rare display of political harmony was seen! SNP President and local MEP Ian Hudghton had drafted a Report recommending that national control over fisheries management within the 12 mile limit of each member state should continue. In an electronic vote the result was 658 votes in favour, with no votes against and no abstentions. The Scottish MEP was congratulated by colleagues from all sides of the chamber and the session President. No one in the Parliament could recall such a result - absolute unanimity - being recorded previously at a plenary session in the EP. A remarkable achievement! Indecision at Westminster must not be allowed to again put the development of CCS projects at risk, as a key European deadline looms to access a €1.5 billion pot of funding. The UK Government has been given until the end of October to confirm whether they will help to fund companies competing for the European funding, a key requirement to enable access to the money. However, with the deadline looming, no confirmation has been forthcoming from the UK Government. A proposed CCS installation at Peterhead Power Station by Shell and SSE is one of the projects in the running for UK Government funding, however it has already been let down twice by Westminster as dithering and indecision saw previous backers pull out in 2007. Another Scottish CCS project at Longannet power station was previously scrapped after the UK Government failed to reach an agreement. “Westminster has a deplorable track record when it comes to encouraging the development of CCS technologies, but it must not allow this deadline to simply pass it by. “There is a substantial pot of European funding that Peterhead Power Station could gain access to with the right support. “If people in Peterhead are yet again let down by dithering and delay on the part of the UK Government, then it will rightly cause outrage in the local area. “The fact is that CCS technology can bring jobs and investment to Peterhead, and in fact it already could have if Westminster hadn’t previously scuppered efforts to bring this technology to Peterhead in 2007. “History cannot be allowed to repeat itself, as Westminster throws jobs out the window through its dithering and delays. People in Peterhead deserve far, far better." Local MSP Stewart Stevenson will be helping out at Barnardo’s shop at 12 Erroll Street, Peterhead on Make a Difference Day, Friday 26 October (tomorrow) in a bid to encourage more people to consider volunteering with the children’s charity. Mr Stevenson will meet Shop Manager Mandy Ross and her team. 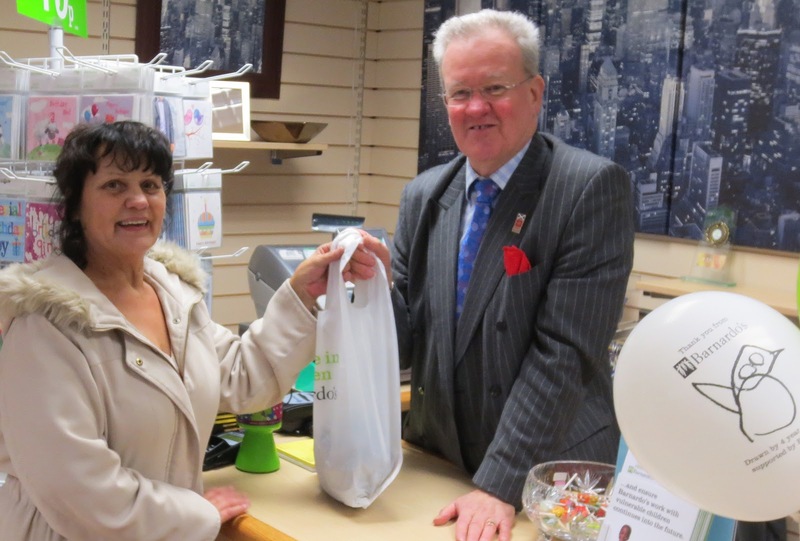 The MSP for Banffshire & Buchan Coast will give up an hour of his time at the shop where he will be helping with activities like serving customers and preparing stock for sale. Stewart is supporting Barnardo’s Scotland’s latest appeal for more volunteers for its shops over the busy Christmas period. Stewart Stevenson and Barnardo’s Scotland are encouraging people to give volunteering a try in one of its shops on Make a Difference Day. Tasks could include preparing the stock for sale, displaying it on the shop floor and helping customers, while creative types might enjoy window dressing. “I am delighted to have the privilege of volunteering at Barnardo’s shop in Peterhead and am very much looking forward to helping out with various tasks. Volunteering is a wonderful way of giving something back to the community and is also an opportunity for people to learn new skills. I would very much like to encourage people in Buchan to consider volunteering at their local Barnardo’s shop, particularly over the busy Christmas period when they could really do with extra help, even if its just a few hours a week. All you have to do is pop into your local shop and find out more." Moray’s MSP and Scottish Government Rural Affairs Secretary, Richard Lochhead, has commented after the Highlands and Islands Food and Drink Awards, which saw four awards come to Moray. In his role as Rural Affairs Secretary the SNP’s Mr Lochhead made the welcome speech at the event and presented the ‘Excellence Award’, which this year went to the Spirit of Speyside Whisky Festival. Banffshire & Buchan Coast MSP Stewart Stevenson highlighted the success of Buckie firm Lossie Seafoods in winning two of the awards covering export development and ‘ambassador of the year’. “I’m delighted for Lossie Seafoods who are an important part of the Banffshire economy and a go-ahead local company. “Now in its eighth year, I am delighted that the Highlands & Islands Food & Drink Awards are getting bigger and better each year. These Awards highlight the fantastic range of top quality and delicious food and drink the region has to offer. All of the winners and nominees can be very proud of their achievements. “I am especially pleased to congratulate 3 of the award winners who are based in Moray - those winners are Macbeth’s Butchers for Best Marketing Initiative, Lossie Seafoods Ltd for Development of Export Markets, Charlie Devin of Lossie Seafoods who received the Ambassador of the Year Award and the coveted Excellence Award went to the Spirit of Speyside Whisky Festival. “These companies, individuals and organisations are an absolute credit to our vital Food and Drink sector and are a great advertisement for Moray both home and abroad. Stewart Stevenson, SNP MSP for Banffshire & Buchan Coast, gave his backing to a Prostate Cancer UK initiative to help men with prostate cancer receive the best possible support and care regardless of where they reside in Scotland. Prostate Cancer UK’s ‘Quality Checklist’ outlines the support men with prostate cancer should expect from the health service through every step of their treatment. At a meeting at the Scottish National Party Conference in Perth, Prostate Cancer UK and Mr Stevenson discussed the survey which showed a wide variation in experience with care that men with prostate cancer received, indicating the requirement for a checklist. The Quality Checklist was produced by Prostate Cancer UK through a process of consultation with men affected by the disease, their families, health care professionals, and policy makers. Prostate cancer is predicted to be the most common cancer overall by 2030. Prostate Cancer UK is suggesting The Quality Checklist is adopted by Health Boards throughout Scotland in order to ensure people with prostate cancer throughout Scotland receive the best possible health service. “Prostate cancer is the most common cancer diagnosed in men in Scotland. The Prostate Cancer UK Quality Checklist is a great source of support and information for men to gain the care they need and deserve. Stewart Stevenson, SNP MSP for Banffshire & Buchan Coast, has pledged his support to the teaching of Emergency Life-saving Skills (ELS) in every Scottish school. Meeting with the British Heart Foundation (BHF) Scotland and partners at the Scottish National Party conference, Stevenson gave his backing to the campaign to ensure that all students in Banffshire & Buchan Coast are taught the skills which would help save a life. ELS training can be incorporated within the guidelines in the Curriculum for Excellence (CfE) very simply and Stevenson himself had a go at discovering how easily Cardiopulmonary Resuscitation (CPR) is learned. There is an average of 25 cardiac arrest calls each day in Scotland to the Scottish Ambulance Service. Prompt CPR can buy time before professional help arrives and can drastically improve the chances for survival. Local authorities should ensure all schools are provided ELS classes, as training only takes two hours to teach and includes CPR, how to deal with serious bleeding, choking, and heart attacks. “Including ELS in our children’s education is an opportunity to save lives. A two hour lesson will give students the skills, confidence, and preparation they need to act in the case of an emergency. Local MSP Stewart Stevenson has welcomed the announcement of the latest round of funding of the Better Breaks programme. The scheme, funded by the Scottish Government supports organisations who provide creative short breaks for the benefit of disabled children, young people, and their carers. A total distribution of £1.2million of grants will begin in April 2013. Mr Stevenson is encouraging all eligible individuals and groups to apply for this funding and to take advantage of application workshops hosted by Shared Care Scotland. A workshop will be held at Marywell Training and Conference Centre in Aberdeen. “The Better Breaks programme is a great cause, which makes a real difference in the lives of disabled children, young people, and their families by allowing them some respite through a short break. It’s a wonderful way to create opportunities for disabled people in our community and goes a long way in aiding recovery and improving quality of life. “The objectors have not only had their day in court but also chance to appeal at the Court of Session, where their case was comprehensively dismissed and now a third bite of the cherry which, frankly, was a step too far and only served to further delay the project and increase costs to the taxpayer. “The people of the North-east signalled their clear wish that this road to go ahead as quickly as possible, as does the Scottish Government, and I am delighted that work on the project will begin immediately. Banffshire & Buchan Coast MSP Stewart Stevenson has welcomed the decision by Stagecoach Bluebird to continue with their bus service to the Seatown at Gardenstown. Stagecoach had undertaken a three-month trial using a different turning area in Gardenstown following difficulties caused by illegally parked cars at the usual turning stance. However, there was concern in the community that if the trial was deemed unsuccessful, the bus service will terminate at the village petrol station. This would have left residents in the Seatown area with a considerable walk up the Gamrie Braes. Gardenstown is famous for its long, winding descent to the village harbour. Mr Stevenson had previously written to and Aberdeenshire Council over the threat to remove a local bus service from the village. The SNP MSP had previously said the council subsidise the bus service and if the present operator cannot or will not provide the required service then they should step aside, refund their public subsidy and allow another bus operator to take over. “This is very good news indeed for Gardenstown. “It would have been completely unacceptable if the bus service had moved to terminating further up the village, but a common-sense approach has prevailed. Scottish Water has launched its winter campaign to encourage customers to follow their winter code. The key steps include protecting your pipes, being prepared for severe weather and ensuring you have heated, insulated and protected your home. This call to act has been echoed by local MSP for Banffshire & Buchan Coast Stewart Stevenson who has urged householders, holiday homeowners, businesses, agents and landlords to take steps to heat, insulate and protect their properties. “We must not be lulled into a false sense of security by last year’s relatively mild winter. “Here in the North-east we can have very severe weather thrown at us and it is only sensible to be prepared. “I would encourage everyone responsible for a property to follow the basic and inexpensive advice contained within the Scottish Water website at:http://www.scottishwater.co.uk/you-and-your-home/be-prepared-for-winter/be-prepared-for-winter. “Those of us who have experienced the consequences of burst pipes will know what a distressing, costly and time consuming trauma this can be”. "The referendum agreement is a very significant milestone towards Scotland achieving the normal independent status of other nations. The fact that the Scottish and UK Governments have reached a detailed agreement on how to allow the people of Scotland their say is of immense importance. “I am very conscious that we would not be at this stage without the contribution of pioneers in the independence cause, such as Douglas Henderson, who represented the North-east at Westminster, who were dedicated to giving people the very choice over independence that was accepted by all sides in the Edinburgh Agreement. “I am also pleased to see the acceptance that 16 and 17 year olds are going to have a vote, and that there will now be a straight yes/no vote on independence on the ballot paper. “Now the debate moves on, both in the North-east and throughout Scotland, to the substance of the issue. What future do we want for Scotland – one where our budget, our welfare system and our taxes are in our own hands, or one where the UK Government continues to short-change Scotland? “Since I became active in politics at a young age I have made the case for Scotland’s independence and I am absolutely delighted that an agreement has been reached on the referendum arrangements that will let the people of Scotland make that vital choice. “This historic agreement sets the scene for the most important constitutional debate and decision that the Scottish people will consider in hundreds of years. “I have been out with Yes Campaigners at different events and people want to get involved in the debate about independence. “People of all parties and none in the Yes Scotland Campaign are putting forward a positive vision for Scotland and I believe the public are responding to that. Banffshire & Buchan Coast MSP Stewart Stevenson is highlighting the importance of World Osteoporosis Day, which takes place on Saturday 20th October. “I applaud and support this initiative to raise awareness of this condition which causes bones to become thin and frail. “It is normally the case that people do not realise that they have the disease until they suffer their first fracture. However, osteoporosis is a treatable condition and with lifestyle changes and medical treatment, many fractures can now be avoided.